TW: ON WHAT AREAS ARE YOU FOCUSING YOUR R&D EFFORTS ON IN 2014? Centre driven chucks, beltless, good results with any type or quality of roll. This is the most important aspect of working with the latest tissue technologies of structured tissue. Automatic splice, increases productivity. No downtime between changes. 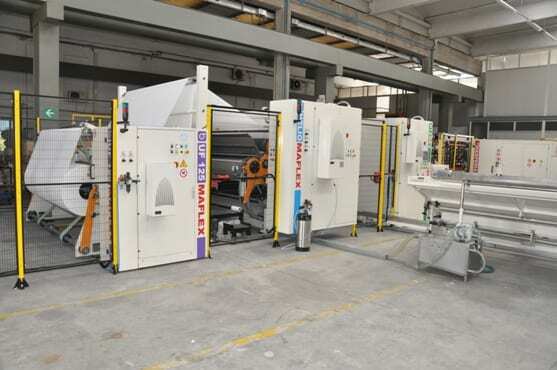 Maflex’s continuos and fully automatic ARES line is able to produce both AfH and consumer rolls. TW: WHAT IS THE KEY ISSUE YOUR CUSTOMERS ARE FACING IN 2014 AND HOW ARE YOU SUPPORTING THEM? TW: HOW ARE YOUR PRODUCTS CONTINUING TO MINIMISE DOWNTIME BETWEEN CHANGES IN PRINT DESIGN, EMBOSSING DESIGN OR ROLL FORMAT? De Rita: “Minimising downtime has been a focal point in our R&D department for a long time. Since all of our customers are looking for the utmost in productivity in each stage of the converting process, all of our machines are designed to require shortest possible time between production changes. Changing the cliché in our printing unit IRIS is very simple and takes only five minutes thanks to the cantilevered sleeve device. TW: HOW ARE YOUR AUTOMATION FEATURES IMPROVING PRODUCTIVE EFFICIENCY? DO YOU HAVE ANY CASE STUDY EXAMPLES? De la Fuente: “We don’t only talk about minimised downtime, but completely eliminating it, increasing productivity of all the lines of our customers. Of course this is true with lines equipped with our unwinds, but also for the rest of the lines in the same facility. 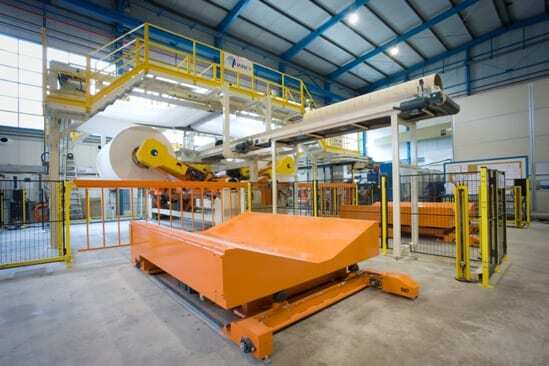 De Rita: “Our converting lines are designed to maximise production efficiency. This is achieved by the use of increasingly more powerful automations. All Maflex equipment allows you to appreciate the efficiency of production linked to automations in three main aspects: control, safety, and energy savings. “The new Maflex lines allow the operator to control all parameters of production and all machine functions through a single interface (HMI). This is possible thanks to sophisticated software and all timing adjustments being controled by motors. Thus, in addition to increased speed, simplified setup and product changes, the operation becomes much safer because it is no longer necessary to physically adjust the machine while it is in motion. Share the post "Minimise downtime Reduce footprints Increase flexibility"